THE 39-year-old Rajah Travel Corp., a leading full-service travel agency in the country, sees an uptick in foreign travels by Filipinos this year, owing to the depreciated US dollar. 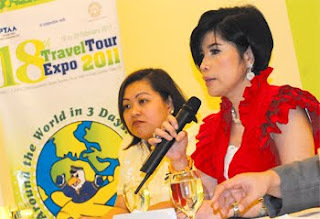 This is projected to boost the travel firm’s bottom line by 30 percent, said its president, Aileen Clemente. Clemente, who is also incoming president of the Philippine Travel Agencies Association (PTAA), is also optimistic that the 3.7-million target in tourist arrivals by the Department of Tourism for 2011 would be attained despite the scrapping of the “holiday economics” scheme of the previous administration. Other factors that will enhance tourist arrivals to the Philippines, Clemente said, are the forthcoming daily flights of All Nippon Airways (ANA) between Narita and Manila, as well as the recently announced “pocket open skies” policy of the Aquino government. Separately, Tourism Secretary Alberto Lim said: “This new service between Narita and Manila will help us obtain a larger share of the Japanese outbound travelers. We are confident that the direct link, complemented by efforts of the Jata [Japan Association of Travel Agents] intermediaries, will stimulate stronger traffic from this major source market.” ANA flights will commence on February 27, with the inaugural flight bringing in Jata chairman Akira Kanai. Jata is the biggest association of travel and tour operators, accommodation and transportation providers and even academic and legal institutions in Japan. According to Department of Tourism (DOT) data, Japan is the third-largest tourist market for the Philippines, growing 10.4 percent to 358,744 visitors in 2010, from 2009. Japan also accounts for a 10.2-percent share of total tourist arrivals in 2010, which reached 3.52 million, surpassing the DOT’s target of 3.3 million. Korea accounted for the largest share of total arrivals at 740,662 or 21 percent, followed by the US, at 600,165 (17 percent). Currently, four airlines combine for 61 flights weekly from Japan to the Philippines. PAL accounts for 32, Japan Airlines for 14, Delta Air Lines for 12 and Cebu Pacific for three. For her part, Clemente said while the issue of the pocket open skies remains “quite controversial…if it is studied properly, [critics would] know its benefits to economic growth, even if confined to say, Clark [Pampanga].” In pursuing a liberalized aviation sector, the Aquino administration has decided to give flying frequencies to airlines of countries which will give reciprocal flying rights to Philippine carriers. Per President Aquino’s Executive Order 84 issued in December, there are only seven three-day weekends in 2011 as most holidays are now pegged on their actual dates. Former President Arroyo practiced what was dubbed “holiday economics,” or moving some holidays to the nearest Monday or Friday, which allowed Filipinos to take vacations. Many tourism establishments and travel agencies credited the boost in domestic tourism sales to this practice. Meanwhile, Rajah Travel’s optimistic projection for 2011 is anchored on an anticipated boost in foreign travels by Filipinos. Tour packages under its “Insight Vacations” brand, which are premier escorted tours to Europe, the US and Canada, are now selling 17 percent lower than usual rates. “We have good rates right now,” Clemente said, adding that Insight Vacations tours are “really a worthwhile investment” for Filipino travelers. Aside from Insight Vacations, the firm also targets middle market, value travelers, luxury travelers and domestic tourists via its other travel brands. In 2010 the travel agency’s sales were up only 12 percent, due to sluggish foreign travels. Several international airlines had to reduce or halt some flights last year due to the ash clouds which were formed from the Iceland volcanic eruption. While the firm’s vacation packages to the Middle East may be affected by the current political troubles in the area, Clemente still remained “confident we can attain our 30-percent target [this year] because of the depreciation of the dollar,” making foreign travel more accessible to a wider market. “We have good deals,” she stressed. Rajah Travel is one of the major participants in the 18th Philippine Travel and Tourism Expo from February 18 to 20 at the SMX Convention Center, which is organized by the PTAA. Over 250 companies—travel agencies, tour operators, as well as local and international airlines, hotels and resorts—will be participating in the travel fair. Exhibitors will offer the public heavily discounted travel packages, including airfare and accommodations, only on those expo dates, the PTAA said. About P300 million in sales are projected to be generated from this year’s expo, up 42 percent from its P210 million sales in 2010.